Cast: Sai Dharam Tej, Kalyani Priyadarshini, Nivetha Pethuraj, Posani Krishna Murali, Sunil, Vennela Kishore, Brahmaji, Bharath, Sudarshan and Others. 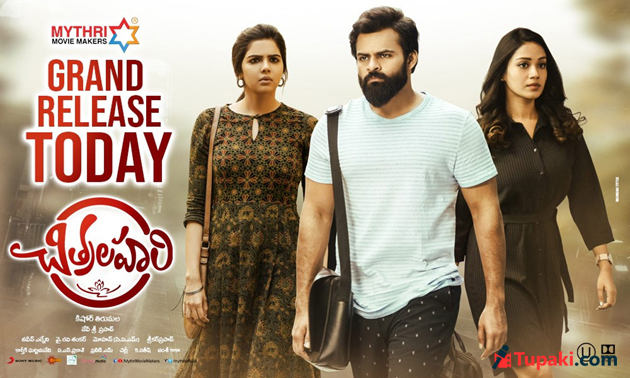 After six successive flops, Sai Dharam Tej tried something different with 'Chitralahari'. Mythri Movie Makers bankrolled this project directed by Kishore Tirumala of 'Nenu Sailaja' fame. Whether the Mega Hero will be able to deliver in the 7th attempt? Vijay Krishna (Sai Dharam Tej), an engineering graduate who is unlucky, leads the life hoping for good fortune. Even his Love Interest Lahari (Kalyani Priyadarshini) calls for break-up with him after a point. This setback makes his situation slip from bad to worse. 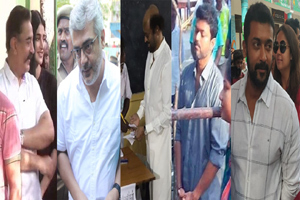 What has Vijay done to emerge successful forms rest of the tale..! Sai Dharam Tej made a conscious attempt to look different and perform like never before. He appears just alike any normal youngster instead of showing heroism. Complete justice has been done to the character be it with his look, body language or acting. Of course, There is scope for improvement in the emotional sequences. Kalyani Priyadarshan and Nivetha Pethuraj brought freshness with them for 'Chitralahari'. They both performed in a satisfactory manner and looked beautiful. However, Viewers start feeling disinterested in their roles as the film progresses. Posani's Role stood as special attraction in the movie. Sunil left a mark of his own after a long time. Even Vennela Kishore and Brahmaji has done justice to their roles. Songs composed by Devi Sri Prasad for 'Chitralahari' are better than his recent albums. 'Prema Vennela' and 'Glassmates' stand out. Rest of the songs are just okay. DSP is capable of doing a lot better. He, however, doesn't disappoint with Background Score. Camera Work by Karthik Ghattamaneni gives a pleasant feeling. Nothing to complain about Production Values. Dialogues penned by Kishore Tirumala are worth praising. Yet again, He showed his speciality in presenting the scenes in a pleasant manner. The Filmmaker, however, failed to make the viewers connect with the emotions. Lack of freshness in the Story, Inconsistent Screenplay & Slow Pace are the biggest flaws. Kishore Tirumala has certainly made a good attempt but he wasn't 100 percent successful. To conclude in one sentence, 'Chitralahari' is the success story of an underdog. The Protagonist succeeded finally after successive failures. You find honesty in his search for success. There are few promising characters who take the story forward, pleasant scenes and feel-good moments in this movie. What's lacking is the required intensity to leave a lasting impression on the movie goers. Novelty is missing in the story but an attempt was made to make it click at the Box Office with interesting characterisations and screenplay. Not just the Lead Pair, Director made a conscious attempt to convey that other artistes too have a character of their own. Especially, The role of Posani will remain special. He excelled as a Father who motivates his demoralised Son to keep aiming for success. Father-Son Bonding is a major highlight in 'Chitralahari'. Even the Characterisation of Heroines is interesting. While Kalyani Priyadarshan appears as a girl who can't take decision independently, Nivetha Pethuraj will be seen as a practical person. However, Kishore Tirumala failed to make good use of the promising characters created by him. At one point, 'Chitralahari' gives a feeling of sitting in a personality development class as the focus is more on Hero's struggle for success. Love Story is like a weak link here. Director failed to establish why hero-heroine fall in love properly. Even the conflict point leading to their separation wasn't strong enough and convincing. First Half of 'Chitralahari' is refreshing to watch. Audience don't find the scenes boring due to the humour at regular intervals. Combination Scenes of Sai Dharam Tej & Sunil have come out well. Even the dialogues penned by Kishore Tirumala elevated many scenes. Predictability and Slow Narration makes the Second Half just okay. The manner in which hero achieves success wasn't presented affectively in the climax. Even the twists n turns in Love Story appear ordinary. Sai Dharam Tej-Posani Episode and Fun generated by Vennela Kishore made the Second Half passable. Overall, 'Chitralahari' have good moments but the impact they create isn't big enough. Bottom Line: The Rise Of An Underdog!